We joyfully affirm that we will offer the grace of the Church’s blessing to any prepared couple desiring Christian marriage. 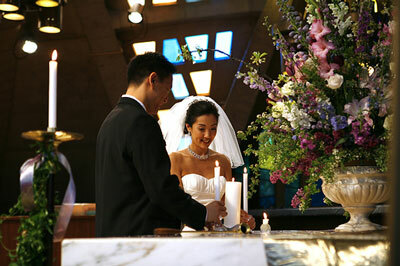 Thank you for considering the First United Methodist Church of Palo Alto for your wedding. 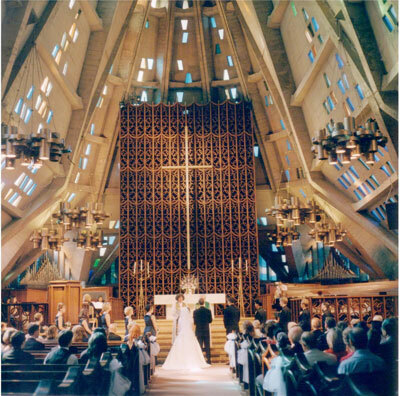 With its soaring ceiling, dramatic architecture, and the magnificent Merritt Speidel Organ, our Sanctuary offers a most memorable and beautiful location for a Bay Area wedding. 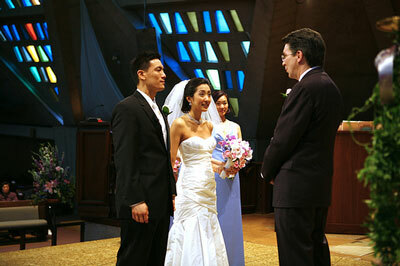 The wedding ceremony in our church is a time of worship in which a couple is united in Christian marriage. We do everything possible to assure that it is also a time of reverence and dignity. No other vows are more sacred; no other commitments more personal than the ones you share at the altar. We invite you to come visit us and see our sanctuary and facilities in person. Our wedding coordinator would be honored to give you a tour, answer your questions, and reserve a date for your wedding. Please contact us at either (650) 323-6167 x107 or weddings@firstpaloalto.com. One of our ministers typically officiates at weddings performed at First Church. After making a reservation each couple will schedule a time to meet with the officiating pastor. This meeting will provide you with an opportunity to become acquainted with the officiating pastor and to plan for your ceremony. Alternatively, couples are welcome to invite non-First Church clergy to officiate at their wedding ceremony. Please speak with the Wedding Coordinator about how best to arrange this. The sloping side walls of our sanctuary dramatically rise up and meet 73 feet off the ground. 1,500 brilliantly hued, small stained glass inserts add to the ambiance. The center aisle is 75 feet long. There are also side aisles to the left and right of the center aisle. The Sanctuary has a seating capacity for over 650 guests. In addition to the seating on the main floor, there is also seating in the balcony. The chancel is raised off of the main floor and 2 choir lofts are located at the rear sides of the chancel area. The sanctuary features the renowned Merritt Speidel Organ. The instrument is now one of the largest in the San Francisco Bay Area, boasting numerous sets of ethereal soft string stops, in addition to many piquant flute stops. The acoustics of our sanctuary are superb, and as a result we regularly host concerts featuring orchestras and choirs from around the world. Our church organist plays for all weddings at First Palo Alto and she would be honored to help you plan the music for your wedding. Vocal soloists or instrumentalists may also be part of your service. If you would like to have them at your ceremony, you will need to contact them directly. All requested music is subject to the approval of our music staff. Videotaping of your wedding service is permissible. Please make your own arrangements with a technician and submit the videographer’s name to the Wedding Coordinator for approval beforehand. The videographer must remain in the choir loft area or the balcony during the service. Audio CDs: Please consult with the Wedding Coordinator for the charge and to make arrangements for recording your wedding. The fee for a wedding ceremony is $2,040. Our Wedding Coordinator will assist you in making a reservation. You will be asked to make a non-refundable deposit of $500 to hold the reservation. The balance of the fee is payable and due at your wedding rehearsal. When your wedding date and time have been confirmed, we will consult with you on all other details for your ceremony. We have several rooms available for receptions. The Patio Room will accommodate up to 50 guests; Kohlstedt Hall, up to 125 guests; and Fellowship Hall, up to 210 guests. Please consult with the Wedding Coordinator on availability and fees. The Wedding fee does not include a reception. Consistent with United Methodist tradition, alcoholic beverages are not permitted on the church premises, and smoking is not permitted anywhere on church property. The church supplies the candles in the major candelabra at the front of the sanctuary. If you wish to have a Unity Candle, you will need to supply your own together with the candle holders for the Unity and taper candles. Please check with the Wedding Coordinator about our guidelines for flowers and decorations. Be advised that we will NOT remove ANY church decorations. Rice, bird seed, confetti, and rose petals (whether real or silk or otherwise) may not be thrown on the church premises. It becomes slippery and dangerous underfoot and is almost impossible to clean up. Similarly, blowing bubbles is not allowed. Food and beverages are not allowed in the Narthex, Sanctuary or Chapel. Please speak to the Wedding Coordinator for information about our reception facilities. The bridal party may dress at the church in rooms near the Sanctuary. They will be opened and available for your use 90 minutes before the start of the ceremony. The date and time of your rehearsal can be scheduled when you make arrangements for the wedding. The rehearsal is directed by the Wedding Coordinator and provides the entire bridal party with the opportunity to rehearse the ceremony. You will need to bring both your marriage license and the balance of your fee with you to the rehearsal. 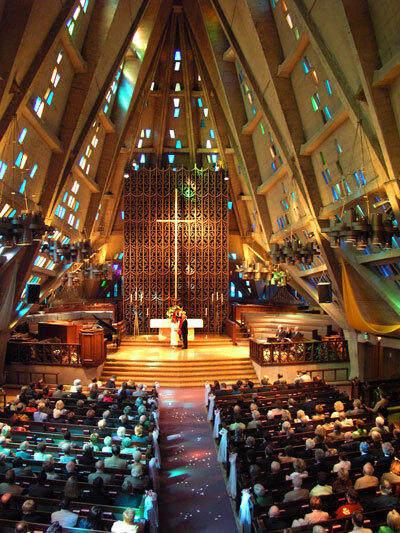 Our Wedding Coordinator is happy to answer your questions, give you a tour, and help you arrange for your memorable wedding at the First United Methodist Church of Palo Alto. Please contact us at either (650) 323-6167 x107 or weddings@firstpaloalto.com. Once again, thank you for considering the First United Methodist Church of Palo Alto for your wedding.